Crayons: Cerulean Blue: An idealized fantasy of the perfect blue of sea and sky....and this perfume contains elements of each: watery notes, airy notes, and little familiar touches of blue. 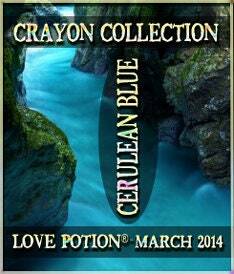 Fans of our Mermaids of Atlantis scent will want to dive right into Cerulean Blue! Cooling cucumber, avocado and maile leaf with floral accents of gardenia and plumeria, a touch of aquatic bladderwrack and a fruity topping of blueberry and black currant. 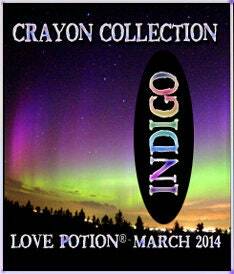 Indigo isn't just a color…it's a state of mind. Symbolizing intuition and the idea of inexplicable energy...the third eye chakra, creative and subconscious processes, the channeling of psychic energy and spiritual awareness. 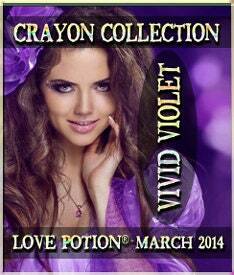 It is a shade deep and rich, possessed of a timeless beauty. Our fragranced recreation is mystical and metaphysical, featuring indigo-colored ingredients as well as those which assist in the opening of your Third Eye. A heart of wild pansy and morning glory with a bright dash of lemongrass EO, soft resinous accents of frankincense, benzoin and patchouli, and a smooth base of Egyptian musk and marshmallow root. Much as the lovely blooms so delicate and soft, the shade between blue and purple was named for this famous flower and is one of the oldest colors known to civilization, symbolizing many passionate qualities in the visible spectrum. Velvety violet blossoms are the star of this show, framed by romantic vanilla and musk, a candied sprinkle of pink and powdered sugars, and glittering drops of grape, lemon and lime on top.